ACFHP works in areas stretching from Maine to the Florida Keys and from the headwaters of coastally draining rivers to the edge of the continental shelf, with a focus on estuarine environments. We have broken our region down into four separate subregions for the purposes of habitat prioritization. They are the North Atlantic (the Canadian border to Cape Cod), Mid-Atlantic (Cape Cod to Cape Hatteras), South Atlantic (Cape Hatteras to Cape Canaveral), and South Florida (Cape Canaveral to the Dry Tortugas). 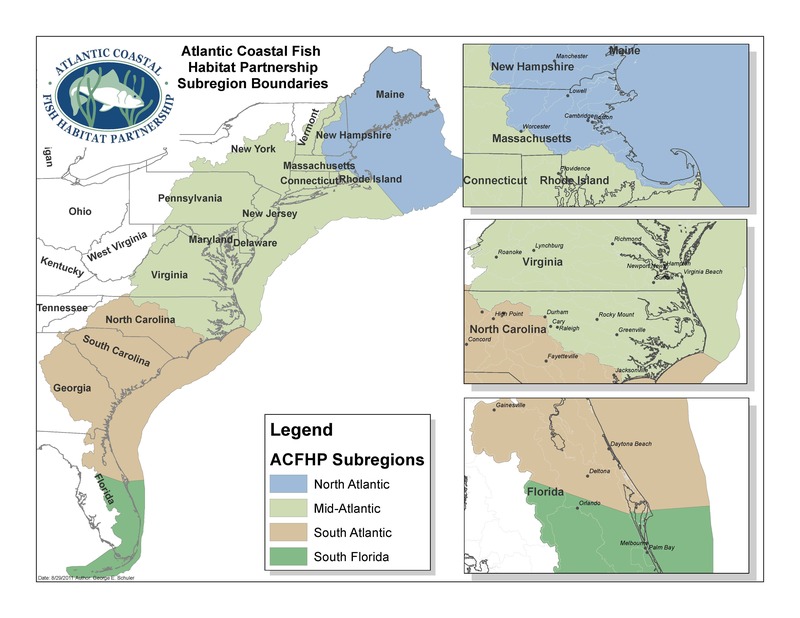 As you can see, ACFHP covers a densely populated region in close proximity to some of the country’s most productive and unique fish habitats. ACFHP’s role in making the connection between headwaters and the continental shelf; NGOs, state, federal, tribal, and various stakeholders; and people and fish habitat is vital to maintaining healthy fish habitat in our region.